turn to a golden era of opulent living as Luxury Defined presents its collection of fine homes that evoke the Jazz Age exuberance and the glitz, glamour, and style of 1920s’ architecture. Gone are the speakeasy, the flapper’s beaded dresses and cloche hats, the collegiate “Oxford bag” trousers, and wasp-waisted suits. But the iconic architecture of, what F. Scott Fitzgerald dubbed, the “age of miracles, the age of art, and the age of excess” will never go out of vogue. Whether the style is Art Deco, Moderne, Bauhaus, Neo-Georgian, Spanish Colonial, or Mission Revival, you will see simplicity and richness of design, clean lines, warm-toned palettes, lavish textures, and visual grace notes as refreshing to contemporary taste as they were to the Gatsbyesque residents of that excessive, often turbulent, but ultimately glamorous epoch of the 20th century. Taking the form of a French château, this opulent seven-bedroom, six-bathroom home in the affluent Montreal suburb of Westmount is graced with a host of lavish features for a taste of 1920s panache layered with all the modern luxuries. 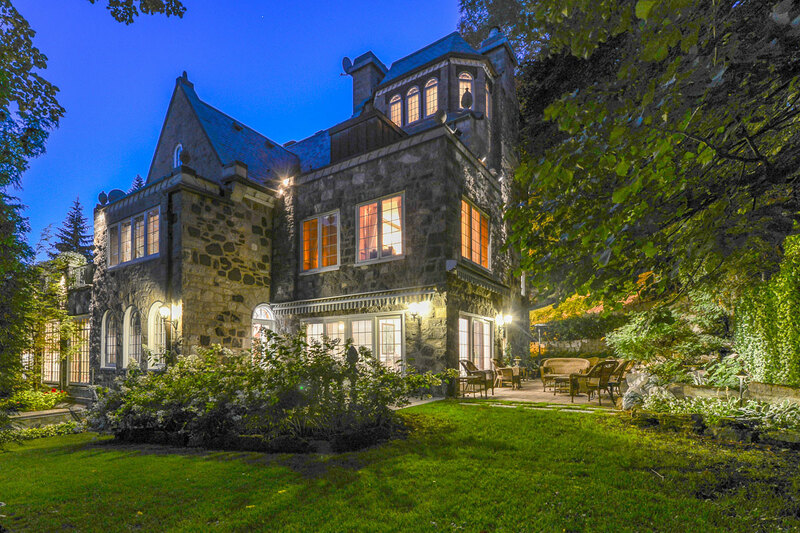 The spirit of post-WWI affluence and style lives on at this château-like manor in a leafy enclave of Montreal. Built in 1927, the four-story, seven-bedroom residence commands 8,000 interior square feet and nearly half an acre of tranquil wooded grounds. The interior architecture harks to the splendor of the past: nine-foot ceilings and mahogany floors, crafted millwork, wainscoting, and coffered ceilings. A library with floor-to-ceiling windows overlooks the garden. Fireplaces warm the grand salon and dining room, which seats 16 comfortably. Creature comforts include an elevator, gourmet kitchen, numerous fireplaces, wine cellar, bar, billiard room, sauna, and gym. There are ample accommodations, seven bedrooms including staff quarters and a master suite complete with fireplace, dressing room and boudoir/office with a private terrace with breathtaking views of Montreal. The essence of classic, California Spanish architecture is captured in this 2,300-square-foot, turreted home in the historic Long Beach enclave of Belmont Heights. Its elegant exterior exudes privacy, yet encloses a lush, open courtyard. Buster Keaton shot silent movies in Long Beach, and he would feel at home in this classic,three-bedroom Spanish Colonial hacienda, restored to its mid-1920s’ grandeur. The interior’s earthy palette uses cream and tan walls accented with dark wood tones, with custom fresco hand-painted crown moldings and ceilings, burnished wood floors, and Spanish tile throughout. The sensational amenities include a gourmet kitchen, separate kitchenette, laundry room, powder room, and library/den. French doors off the formal dining and living room open to the courtyard’s resplendent garden with waterfall, pond, and seating area surrounding a fire pit. Upstairs, the three bedrooms all have individual balconies and cedar walk-in closets. The garage includes superb guest quarters above. This Stono River home offers spectacular views from airy interiors with a formal living room, a vast galley kitchen, and a cedar-clad library, as well as its own private dock — and that river to dream on. 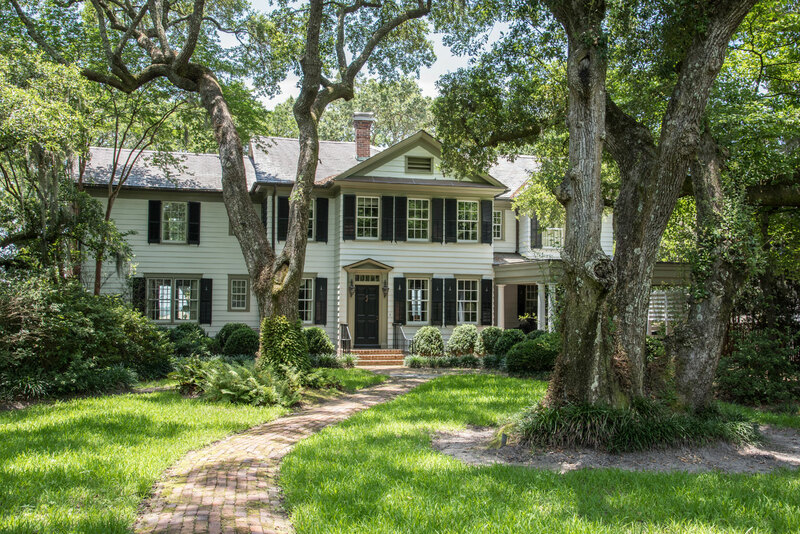 This star of this elegant waterfront home is a breathtaking front-row panorama of Charleston’s Stono River. Adding to the splendor is a deepwater dock with a 30-foot floater, eight-ton boat lift and a dry slip, all serviced by a generator, water line, and boat shed. The ornate 4,560-square-foot interiors have retained all of their 1920s opulence. 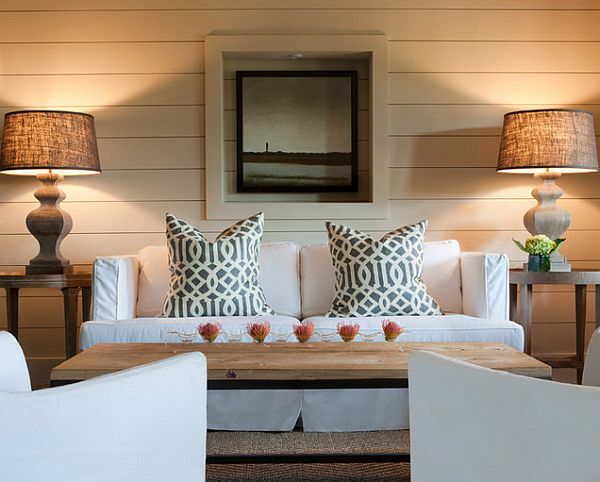 A study with cypress built-ins adjoins the family room and formal living room with fireplace. The covered patio with Jenn-Air grill is just off the eat-in kitchen with Wolf appliances and a wet bar. The second floor’s master suite has a large walk-in closet and a lavish spa bathroom. The third and fourth guest bedrooms look out upon enchanting views of the river. 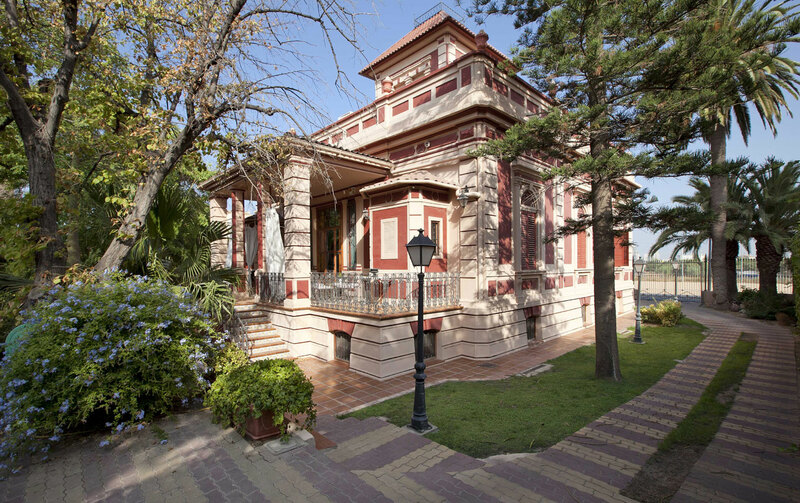 This Rationalist-style villa in the Moorish enclave of Benimàmet in the city of Valencia was built in 1928. A restoration in 2008 has preserved its striking façade and 1920s architectural motifs, such as stained glass windows and mosaic-tiled floors. This traditional Valencian villa was built in 1928, during the Spanish Rationalism period, when clean lines, geometric forms, and structurally defined spaces were paramount. Renovated in 2008, the residence features a multi-tiered façade and original Art Deco elements such as ornate stained glass finishes, beautiful mosaic-tile floors, and decorative beamed ceilings. There are five bedrooms, formal reception rooms, and luxury amenities including a wine cellar and lower-level recreation area for entertaining in style. The mature landscaped garden is an oasis of serenity complete with spaces for alfresco entertaining, including a unique paella cooking area. From its grand foyer to its Neoclassical-inspired terraces, this 7,849-square-foot Mediterranean Revival mansion in San Antonio is the epitome of Roaring Twenties glamour — Texas style. 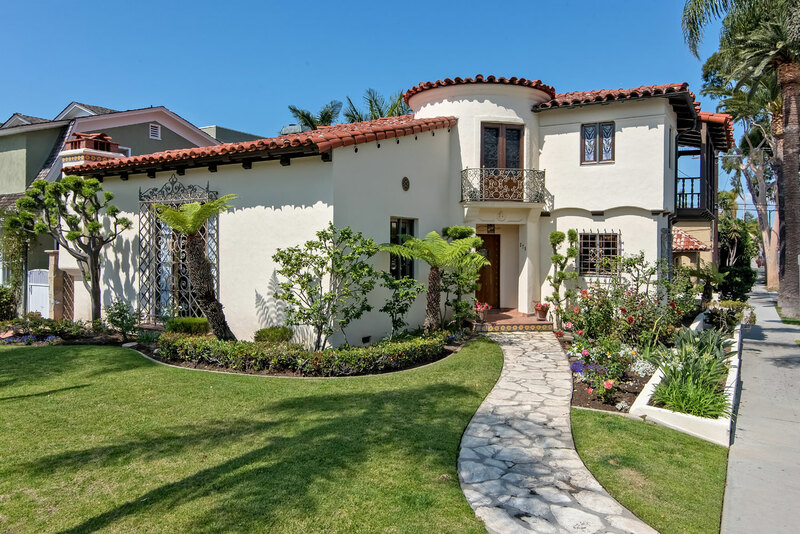 Built in 1923, this Mediterranean Revival is distinguished by its exquisite proportions and craftsmanship. Evoking a Gatsbyesque grandeur, a gated entrance opens to a long driveway that winds past close-cropped lawns to arrive at sumptuous Neoclassical-inspired checkered terraces and a grand foyer. Arched sliding pocket doors open onto a library with outdoor access, a dining room, and a formal living room with a detailed fireplace and adjoining sunroom. 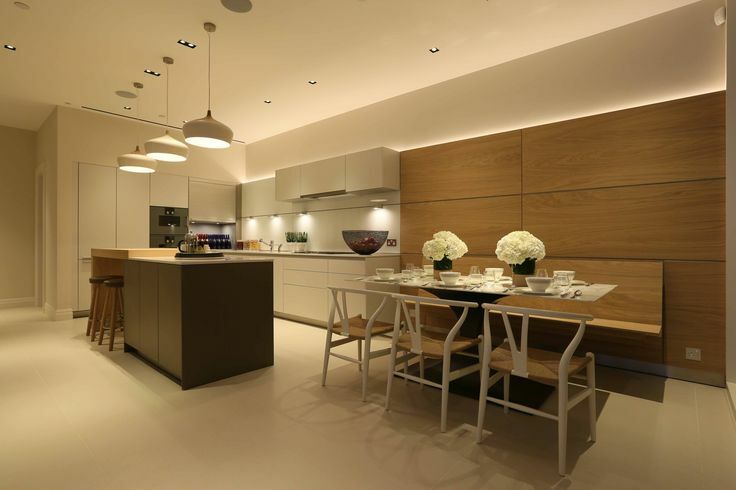 The large-scale kitchen offers restaurant-grade appliances and a butler’s pantry. A grand staircase ascends to a spectacular living area that opens onto a balcony revealing enchanting views of the parklike grounds, replete with a canopy of trees and specimen plants. Seven classically appointed bedrooms and five bathrooms comfortably accommodate owners and overnight guests. A stately mansion built in 1921, Villa Hoogenoord has been exquisitely restored and updated for 21st-century country living. Villa Hoogenoord was built in 1921 on three quarters of an acre of landscape-sheltered grounds in the pastoral, Medieval province of Utrecht. Behind massive wooden double doors, roomy, light-filled interiors await, especially the 645-square-foot living room, with its monumental tiled fireplace and half-round sunroom. 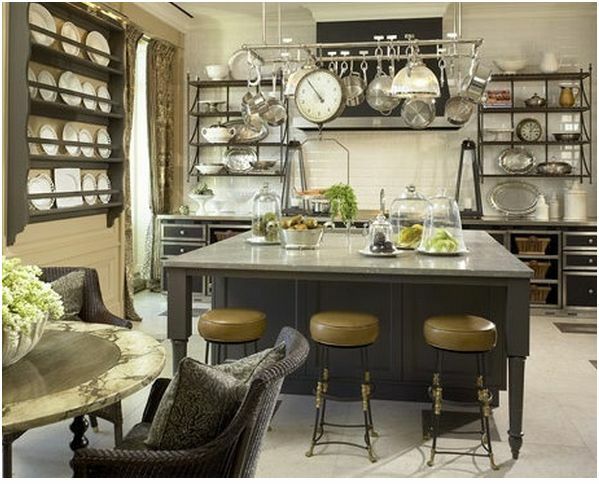 The dine-in kitchen is an epicurean’s dream with a fireplace, wainscoting, and a coffered ceiling. The upper floor has a balcony revealing a pastoral perspective at the front of the house. The central hall accesses three bedrooms (two with a balcony) and the luxe master suite. A detached stone outbuilding provides a cozy living space with underfloor heating, kitchen, sauna, and parking garage. 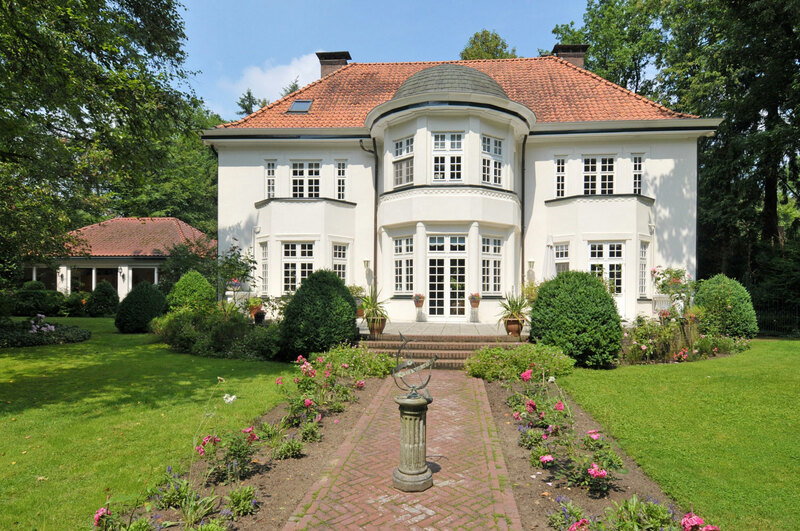 In addition to glorious grounds, this exclusive estate enjoys proximity to the historic center of Doorn, famous for the eponymous castle that was home to the last German Emperor, Kaiser Wilhelm II. You’ll never go hungry in these homes with outdoor kitchens as beautiful as their indoor counterparts. Ever wonder what it would be like to flip burgers while overlooking the Pacific Ocean? Do you imagine whipping up a frozen margarita just steps away from your infinity pool? (Remember — plastic cups only!) Outdoor living and entertaining spaces have exploded in popularity over the past few years, replacing the tried-and-true charcoal grill with full-service cooking areas, including ventilated grills, smokers, rotisseries, weatherproof cabinetry, outdoor refrigerators, stone sinks, and more. Dream big and take inspiration from these stunning outdoor kitchens across the country, from homes for sale in Malibu, CA, all the way to Myrtle Beach, SC. Built in 2011, this four-bed, three-bath home in Carrollton, TX, has a stylish interior and an even more extraordinary exterior. Dine under its pergola or covered patio any night of the week — each part of the outdoor kitchen is complete with ceiling fans to cool you off on a hot summer day. When it does get too hot outside, simply head inside to the indoor kitchen, complete with granite countertops and an island bar area — perfect for gathering friends and family around. This Houston, TX, abode is a chef’s dream, complete with a screened-in patio and kitchen grill area. There’s no need to ever step inside when a refrigerator, sink, grill, and warmers are all at your fingertips on the patio. Not to mention, the home’s most distinctive amenity — the Jacuzzi tub — is conveniently adjacent to the outdoor bar. As for rainy days, there’s a full bar inside too, as well as two large, renovated bathrooms and a home gym. This extravagant beachside mansion has massive kitchens — inside and out. The backyard features a central cooking area, screened lanai, and a remote-controlled fire pit. Entertaining is easy-breezy on the back patio as the wind from the Intracoastal Waterway joins you for alfresco dining. This new construction Grand Dunes estate was completed in December 2015 and offers large windows that stream in natural light from the home’s expansive backyard. Another Myrtle Beach, SC, beauty, this home has breathtaking inlet views to enjoy from the outdoor covered patio. Watch the Carolina Panthers on the outdoor flat-screen TV or sit and enjoy a drink at the bar while your filet mignons sizzle on the grill. The extravagant interior is simply a bonus to the exterior amenities, complete with traditional decor, a large master suite along with three additional bedrooms, and an entryway mudroom with handy built-ins for storage. Vibrant colors are no stranger to this Bend, OR, home — and we hope entertaining isn’t either. Relax by the fire or enjoy happy hour with friends at the shaded outdoor kitchen as you become one with nature. Can you believe those mountain views? Once inside, pear-green accents and plum walls add whimsical charm to this 3,490-square-foot home’s interior. This chateau-style sanctuary has picturesque views outside its whopping 10,400 square feet. Carefully select a wine to sip while overlooking the Pacific Ocean from the home’s extensive wine cellar. If you tire of the outdoor perks, including a pool, spa, and spacious cooking and dining space, head inside to the home gym, movie theater, or game room. Pro tip: Even if you don’t have an outdoor kitchen, add a bistro set to your own outdoor living space to create a breakfast nook, like on this home’s balcony. This modern oceanfront abode, called “La Cristal de la Mer” (the Crystal of the Sea), will keep you entertained in its sky lounge, complete with an outdoor fireplace, grill, and dining area. Easily stroll down to the beach from your back door and listen to the waves crash as you watch TV in the indoor/outdoor lounge. Inside, take a decorating note from the home’s award-winning interior designer, Karen Butera: The house features Ann Sacks glass tile, backlit white onyx countertops, Swarovski pendant lighting, and Italian cabinetry. This ’bu abode will transport you to an island oasis within your own backyard. Create a feast on commercial-grade appliances, then relax as though you’re at a resort on plush white lounge chairs by the pool. This space truly embraces indoor-outdoor living: Almost the entire dining area and (inside) kitchen open to the outside, giving it a luxurious yet exotic feel — the palm trees don’t hurt either. While only minutes from the beaches of Malibu, CA, you’ll never want to leave this California hideaway. 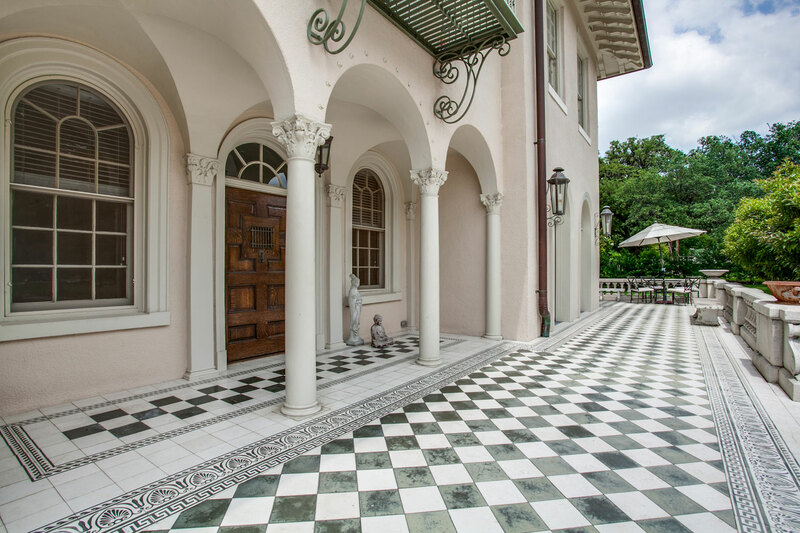 This custom Italianate villa will make your jaw drop: It features custom mosaic tile floors, a great room with 800-gallon saltwater aquarium, and master bath with steam shower, just to name a few perks. But the pièce de résistance is the rooftop kitchen, accessed by a 16-foot rotating skylight (yes, you read that correctly). And there’s more: This five-bedroom, 10-bath home has its own sports bar complete with a pool table and flat-screen TV, a three-car garage, and its own movie theater. This mountainous haven will surely make you a homebody — everything you could ever dream of is right inside the eight-bedroom, nine-bath property. No heavy lifting required: The home is fully furnished and move-in ready. You’ll be able to cook for your crew in two outstanding kitchens — one inside and, you guessed it, one outside. And while you may get lost in the 14,000-square-foot house, the wafting smell of steaks cooking on the grill will draw you back to the outdoor spa and fire pit. This new era of working “when it suits you” has catalyzed the trend towards home offices or hubs. A place where you can not only do business, but surf the web, connect with distant friends and relatives, and while away the hours gaming. Indeed, the very notion that a home office should be an isolated unit is outmoded. Designers are now integrating offices within a home’s communal areas – whether connected to the living room, part of the master suite, or used as a multi-purpose space. 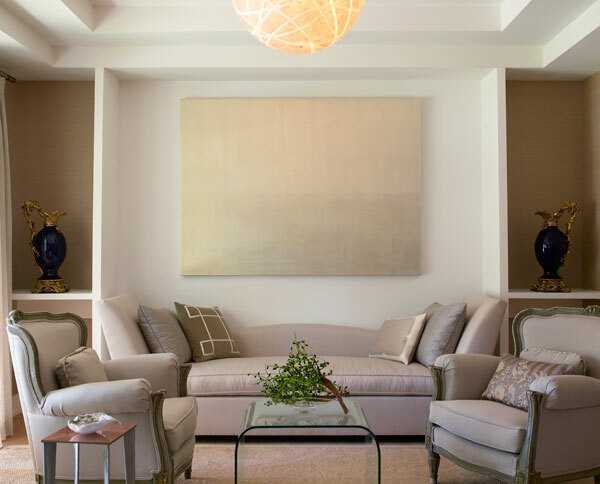 In one oceanfront property, Schultz utilized all the space available to create a fully functioning home hub adjacent to the home’s primary living area. One of his clients wanted a stylish and functional office area that, when not in use, blended seamlessly into the living space. Griem had ample storage built into the wall to hide office clutter and maintain the space’s clean lines, as well as enlarging the room’s windows to keep it light and airy. Thomas Griem of TG-Studio designed this bespoke home office for a client who wanted the space to flow naturally from the living area. 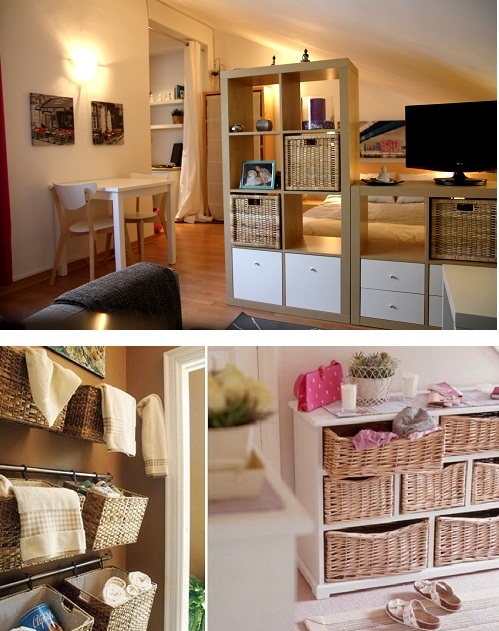 Discreet storage has been built into the wall to minimise clutter and preserve the elegant look of the room. 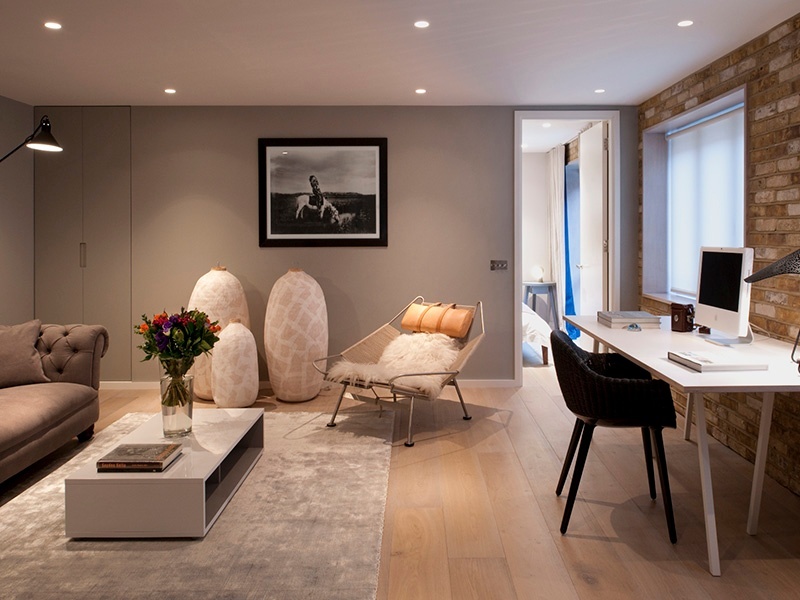 Home offices designed by furniture-maker Neville Johnson balance beautiful design with functionality. 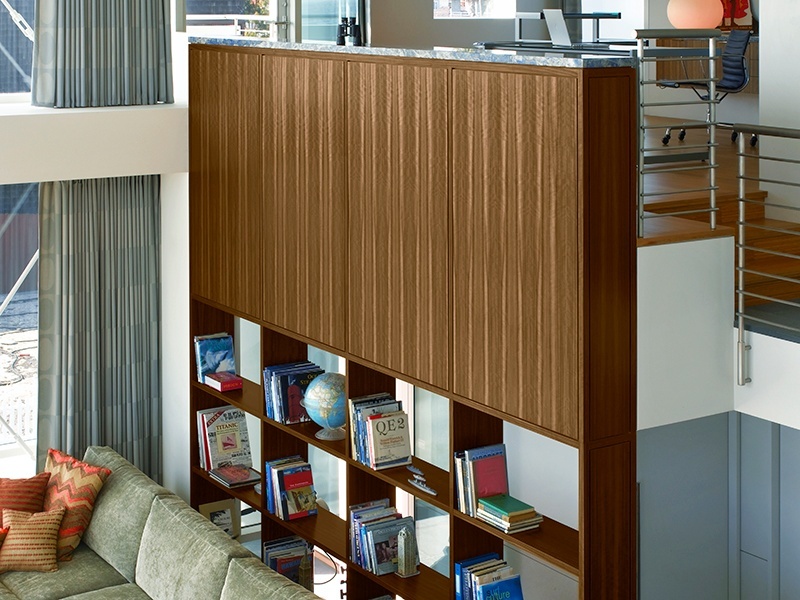 The company offers a wide selection of finishes for its bespoke office furniture, including hand-selected wood veneers, gloss, glass, and over 1,000 paint colours. 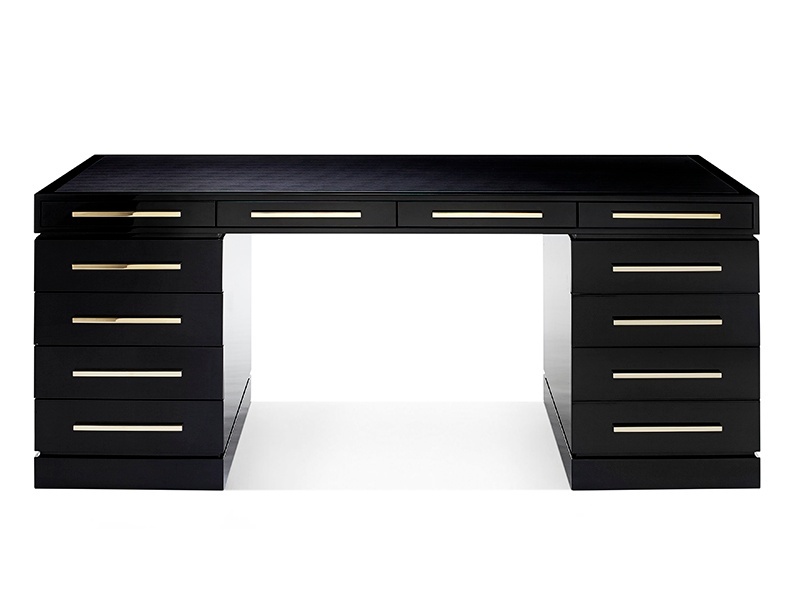 The Wellington desk by British brand Davidson is the perfect combination of style and function: it is hand-crafted in the UK and finished with a special lacquering technique, resulting in an attractive high-gloss finish. And, of course, any home office will require storage and accessories: a simple item like an Aston Martin paper knife, or a pair of elegant globe bookends by Eichholtz, for example. L’Objet has some beautiful crocodile-effect pieces, crafted from porcelain and flattered with 24-carat gold detailing which would be a stunning addition to any home office. Las principales ventajas de la tecnología LED. Cómo aplicarla y elegir la mejor opción para cada ambiente. La aparición de la iluminación LED, que revolucionó la manera de alumbrar grandes superficies, llegó a las casas. A diferencia de la tecnología convencional, la LED permite un ahorro de energía del 80% y tiene una duración de 20.000 horas de uso, el equivalente a 20 años de vida útil. Además, no necesita ningún tipo de cuidado especial y no emite calor. La otra diferencia es económica: las luminarias leds son mucho más caras que las halógenas comunes, ya que su valor va desde los $750 hasta los $15.000, dependiendo del tamaño de la aplicación. 1. La instalación eléctrica no requiere de ninguna preparación. Cada aplique tiene incluido en su diseño el driver para la conversión de electricidad. 2. Los aparatos se dividen según su uso para interiores y exteriores. En el primer caso, se emplean colgantes, spots, aplicaciones de pared y plafones. En el segundo, aplicaciones de pared para los perímetros. Por otra parte, Philips lanzará en 2015 al mercado una línea de aplicaciones para jardines alimentada por paneles solares. 3. Para elegir la luminaria correcta hay que tener en cuenta tres factores: las dimensiones del ambiente, las actividades que allí se realizan y el clima deseado. – En el comedor, lo ideal es recurrir a una luminaria colgante por sobre unos 80 cm de la mesa principal. De este modo, se genera un ambiente de intimidad. – En el living es recomendable contar con una luz general y emplear apliques de pared para destacar detalles de la arquitectura y generar al mismo tiempo sensación de profundidad. Si se quieren resaltar rincones con objetos, los spots direccionales son útiles para generar un cono de luz sobre la pieza. – En el dormitorio, la luz debe ser cálida. Además de la general, se pueden implementar luminarias de pared encima de la cabecera para los momentos de lectura y colocar una lámpara de pie dimerizable para regular la intensidad. – En la cocina la iluminación debe ser brillante. Allí se pueden acentuar zonas con luminarias direccionales de techo o ubicar spots empotrados para reducir las sombras y destacar los colores de los alimentos. La iluminación lineal es otra opción funcional y moderna, especialmente sobre las mesadas. – En el baño conviene emplear una luz brillante sobre el espejo para eliminar las sombras. Si se recurre a haces de luz desde la parte superior y los lados del espejo, éstos deben centrarse en un punto focal, preferentemente en el centro del espejo. Seguro ya notaste que los jardines verticales son lo de hoy. ¿Parecen complicados? 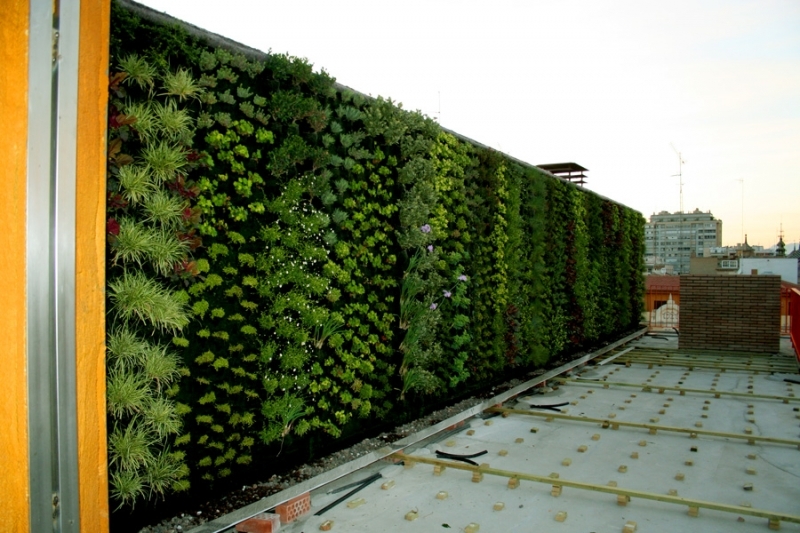 En absoluto: los jardines verticales o paredes de cultivo no son más que jardines plantados verticalmente en una pared. Se pueden cultivar en casi cualquier tipo de muro, con o sin el uso de suelo, y se pueden colocar tanto en interiores como en exteriores. Y mientras no haya escasez de agua para la pared viviente, no se requiere usar el suelo. Estos jardines te permiten sembrar una gran diversidad de plantas: perennes, comestibles, plantas nativas o tolerantes a la sequía. Lo ideal es utilizar aquellas plantas tropicales que se adaptan a bajos niveles de luz y temperatura constantes. También puedes sembrar plantas de ornato, flores, frutas o verduras. Generalmente el clima de interiores se caracteriza por una temperatura de alrededor de 20° C y una intensidad de luz y humedad baja. Para estas características de jardines interiores, las mejores plantas son aráceas como Philodendron y Epipremnum, muchas especies de Peperomia y Begonia o diferentes helechos como Nephrolepis y Pteris. Para montar un jardín vertical se necesita una estructura metálica que se puede adquirir en las tiendas de artículos de jardinería, o bien, puedes hacerla tú mismo. Entre la estructura y la pared que elijas para colgarla debe quedar una cierta separación para evitar el exceso de humedad y que circule un poco el aire. 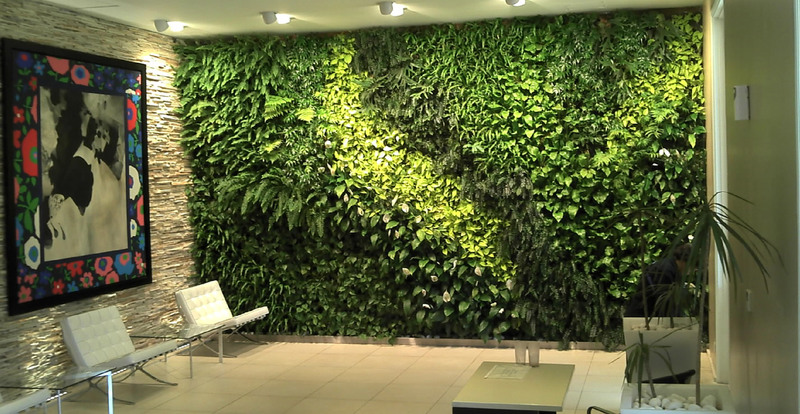 Lo divertido de los jardines verticales es que cada pared es un proyecto, tú adaptas el montaje a las características del espacio que tienes disponible. Su éxito reside en lograr un sustrato liviano y rico en materia orgánica, debe contar con muchos nutrientes, porque como el espacio es reducido, las raíces deben tener todos los elementos para alimentar la planta. Lo más importante en su cuidado es el riego. Hay que recordar en todo momento que el agua se aprovecha de arriba a abajo, por lo cual no hay que saturarlo de líquido para que no pese demasiado, el material del sustrato ayudará a retener la humedad. Es importante resaltar los beneficios que las paredes de cultivo tienen para el medio ambiente: limpian el aire de contaminantes, retienen polvos volátiles, mejoran la imagen interior de edificios, reducen el estrés, permiten la producción de vegetales, frutos y hortalizas y también actúan como barrera de aislamiento acústico. Asimismo, los jardines verticales sirven para separar espacios y volver a la vida edificios ruinosos. Además, se están haciendo cada vez más populares en el interior de los edificios de oficinas, las casas y las tiendas. Sin duda, se trata de una fantástica opción para decorar debido a su gran belleza y sus propiedades naturales. 3. Entorno Verde: diseño y construcción de roof gardens y muros verdes. 4. Verdetotal MX: azoteas y muros verdes, captación de agua pluvial y energía solar. Ya sea que te acabas de mudar o estás buscando cambiarle el look a tu casa. Hay algunos trucos de diseño interior bien conocidos que los diseñadores emplean y que tu también puedes hacer fácilmente con un mínimo esfuerzo y costo . A veces las cosas más pequeñas causan el mayor impacto. 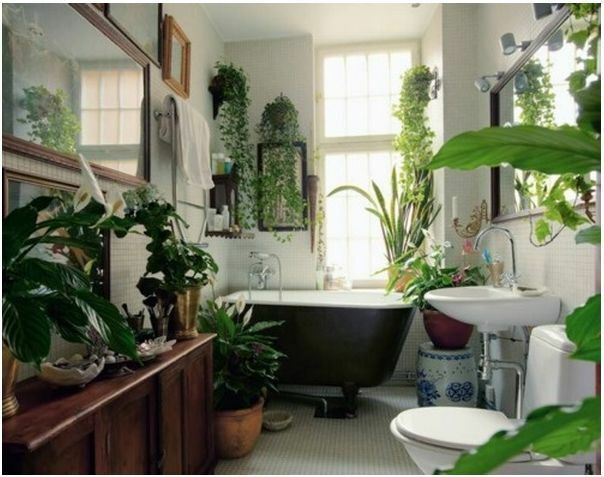 Podría ser la adición de un espejo, una pintura, una lámpara o incluso una planta. Tal vez quieres suavizar tus paredes, iluminar una habitación, o añadir un poco de calidez a tu espacio vital. ¡Echa un vistazo a estos consejos de diseño inteligente y ve cómo te puedes inspirar! 1. Pintar las habitaciones más pequeñas en suaves y colores más claros para ayudar a hacer que la habitación parezca más grande. El de arriba es un gran ejemplo de cómo aprovechar al máximo un espacio pequeño. 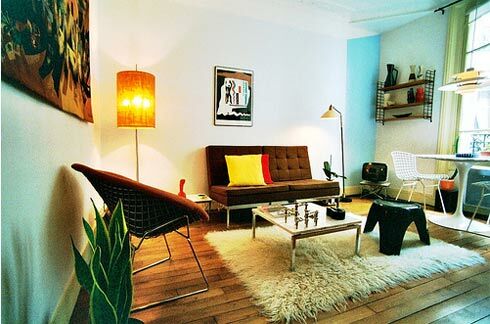 Una sala de este tamaño tiene la tendencia a parecer pequeña, pero los grandes ventanales, paredes de colores claros y un amplio uso de los espejos no sólo reflejan la luz natural llegando de las puertas y las ventanas, pero el uso de espejos también da la ilusión óptica de espacio, haciendo que la habitación parezca más grande de lo que realmente es. Por el contrario, los colores oscuros harán que una habitación parezca más pequeña. A pesar de la abundancia de luz natural y la colocación estratégica de los espejos, esta habitación en un tono más oscuro se sentiría más encajonado. 2. Use los espejos decorativos para añadir luz al instante a su espacio vital. Como se ha visto anteriormente, los espejos también se pueden utilizar para hacer que un espacio pequeño parezca más grande. Para las grandes salas, o cualquier habitación con una cantidad más limitada de luz natural, espejos colocados directamente en frente de las ventanas, sumará luz instantánea. 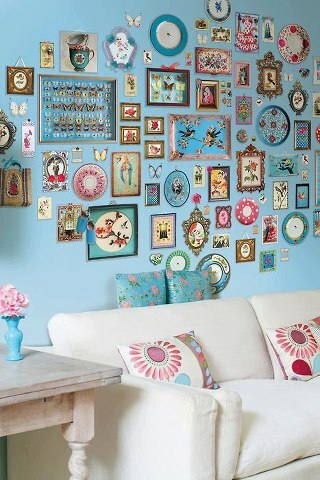 Los espejos decorativos también se pueden utilizar en lugar de arte para llenar el espacio vacío de la pared. Grandes o pequeños, llos espejos añaden luz y dimensión a tu espacio vital. 3. Mezcla. Mezclar diseños y texturas. Mezcle viejo y nuevo, caro y barato. 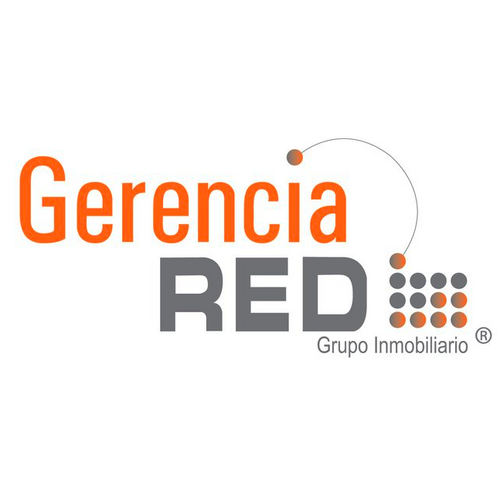 No hay nada malo con la colocación de las herencias de la familia junto a tu sofá moderno. Todos los buenos decoradores de interiores te dirán que el aspecto más importante de la decoración de tu casa es que refleja quién eres, tu personalidad y tu estilo. El escritorio Chippendale antiguo que tenía tu abuelo cuenta una historia. Cuenta la historia de su pasado. El sofá moderno del que se enamoró y simplemente tenía que comprar también cuenta una historia, su historia presente, y no hay razón por la cual el presente y el pasado no puedan coexistir muy bien juntos. Lo mismo puede decirse para el arte. Ahora, es posible que no desees colocar un cuadro de Salvador Dalí en la misma pared al lado de un Monet, pero no hay razón por la que no pueda estar en la misma habitación. Con las telas ya sean muebles, alfombras o almohadas, variados colores y diseños pueden aportar calidez y textura en su espacio vital. 4. Caer en algo un poco más cómodo! Las fundas a menudo tienen una mala reputación, pero son cosas verdaderamente maravillosas. Pueden servir como un medio de cambiar el aspecto de tus muebles para reflejar las estaciones. Estas cubiertas que se quitan fácilmente, le permiten tener un aspecto sofisticado sin tener que preocuparse por la gente que constantemente ensucia o derrama en tus muebles. Las fundas son ideales para las habitaciones utilizadas frecuentemente por los niños. En esta foto, las fundas blancas le da al espacio un aire casual, elegante y confortable, fácil y sofisticado. Las cestas de mimbre son una manera económica y elegante de añadir almacenamiento a cualquier habitación. Las cestas se pueden utilizar para almacenar y mostrar libros, revistas de arquitectura y decoración, juguetes, toallas y mantas para nombrar unos pocos. Coloca un par de cestas de mimbre pequeñas en la parte superior de tu cocina para mostrarlas bellamente y almacenar tus frutas y verduras. 6. Usa lo que ya tienes para decorar. Todos tenemos elementos en nuestro poder, probablemente guardados ​​en cajas en algún lugar y no se les ha dado una segunda mirada. Tu casa necesita algunos accesorios. En lugar de correr a la tienda, toma un buen vistazo a lo que ya tienes. Las bandejas, madera, metal, acrílico o plata se pueden colocar en la parte superior de los jugueteros o racks, carritos de té, baúles, mesas de noche y mesas de café para dar más textura y dimensión. Arregla velas en ellos, cuadros o apila libros en la parte superior de ellos. Platos se pueden colgar de la pared para crear arte maravilloso. Arte de los libros para niños puede ser enmarcado y colgado en guarderías, cuartos de niños o en sus cuartos de baño. Te sorprenderá de lo que se puede hacer con lo que ya tienes! 7. Añadir una agarradera colgando de tu cocina. Las cocinas están destinadas a ser cálidas y acogedoras. Pasamos gran parte de nuestro tiempo en ellas, ya sea para la preparación de las comidas, servir comidas o entretenimiento. Un estante colgante para sartenes es elegancia útil. Las cocinas están diseñados para sentirse como si estuvieran en uso constante y un estante colgante para sartenes sin duda hace que uno se sienta de esta manera. Además de un aspecto tan maravilloso, (hay muchos tamaños y estilos disponibles) deja espacio libre en el armario para almacenar otros artículos. Pocas veces alguien se queja de tener demasiado almacenamiento. 8. Respetar el medio ambiente. Agrega plantas a tu espacio vital. Añade a cada habitación, pequeña o grande, pocas o muchas. Las plantas son un medio barato de accesorios a tu espacio y añaden color y textura. No sólo son hermosas las plantas pero muchas pueden limpiar el aire y la humedad del hogar otorgando balance. Pueden absorber contaminantes y eliminar los gases nocivos del aire. Ningún hogar debe estar sin estos verdes maravillosos! 9. Pinta o tapiza tus estanterías. Este instantáneo disparo de color traerá brillo y re-energizará cualquier habitación. Es increíble como algo tan sencillo como una capa de pintura de color al instante puede dinamizar y transformar tu espacio. Esta biblioteca seria sencilla y ordinaria, sin este azul brillante. Tal vez la forma más sencilla y mas barata de las transformar tu espacio aburrido es aplicando una capa de pintura en algún inesperado lugar. Las bibliotecas son un lugar ideal para empezar, ya que no es necesario pintar una superficie grande. Otros lugares divertidos para añadir un toque de color incluyen chimeneas, los interiores de armarios, pasillos y techos. 10. Use alfombras para amortiguar pisos de madera. Las alfombras dan calor y pueden agregar una gran textura, color y personalidad a tu espacio vital. Los pisos de madera son hermosos y fáciles de mantener, pero carecen de la comodidad que ofrecen suelos de moqueta, sobre todo en los meses más fríos. Las alfombras pueden añadir diversión y funcionalidad a tu espacio vital. Utiliza varios de diferentes patrones y tejidos juntos para mostrar tu carácter. También puedes añadir varias alfombras del mismo patrón y tela o texturas diferentes pero del mismo color. Las posibilidades son infinitas. Puedes cambiar las alfombras para reflejar las estaciones que utilizan tonos más cálidos y tejidos para los meses más fríos y más ligeros para los días más calurosos del año. Hay muchas alfombras hermosas de algodón, alfombras lavables que son ideales para los hogares con niños. Realmente no hay razón para que un hogar con niños pequeños no pueda ser también uno con estilo.